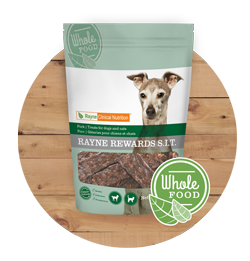 We have a broad range of treats to meet the needs of your pet. The biscuits are low calorie, low fat, low phosphorus, and have no animal protein or fat. These are safe to feed dogs with any medical condition. Ingredients: Peas, chickpeas, cane molasses, pumpkin, apples, canola oil (preserved with naturally mixed tocopherols and rosemary extract), pumpkin seeds, sea salt, natural avour. Perfectly paired with our Low-Fat Kangaroo-MAINT diet, our jerky treats are not only healthy and delicious but can be given to both dogs and cats. The protein source aligns with our diet offerings making it even easier to find the perfect treat for pets with sensitivities. Perfectly paired with our Rabbit-MAINT diet, our jerky treats are not only healthy and delicious but can be given to both dogs and cats. The protein source aligns with our diet offerings making it even easier to find the perfect treat for pets with sensitivities. Perfectly paired with our Growth/Sensitive-GI diet, our jerky treats are not only healthy and delicious but can be given to both dogs and cats. The protein source aligns with our diet offerings making it even easier to find the perfect treat for pets with sensitivities. Perfectly paired with our Growth/Sensitive-GI, and our Healthy Reduction-MCS diets, our jerky treats are not only healthy and delicious but can be given to both dogs and cats. The protein source aligns with our diet offerings making it even easier to find the perfect treat for pets with sensitivities. Perfectly paired with our Crocodilia-MAINT diet, our jerky treats are not only healthy and delicious but can be given to both dogs and cats. 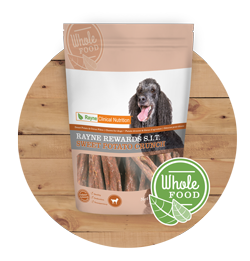 This extremely novel protein source aligns with our diet offering making it even easier to find the perfect treat for pets with sensitivities.